I beg the indulgence of re-posting this piece about a very Christmassy book indeed. (It first appeared on this blog in 2014.) I am still busy writing my new book, which I'm hoping to finish some time in January (oh, all right then, February) which is why this blog has been a little neglected of late. In the meantime, I wish all you lovely people the happiest of Christmas holidays and all the other midwinter festivals - and the very best of new years. Here is my much-worn, much-loved childhood copy of The Lion, the Witch and the Wardrobe. 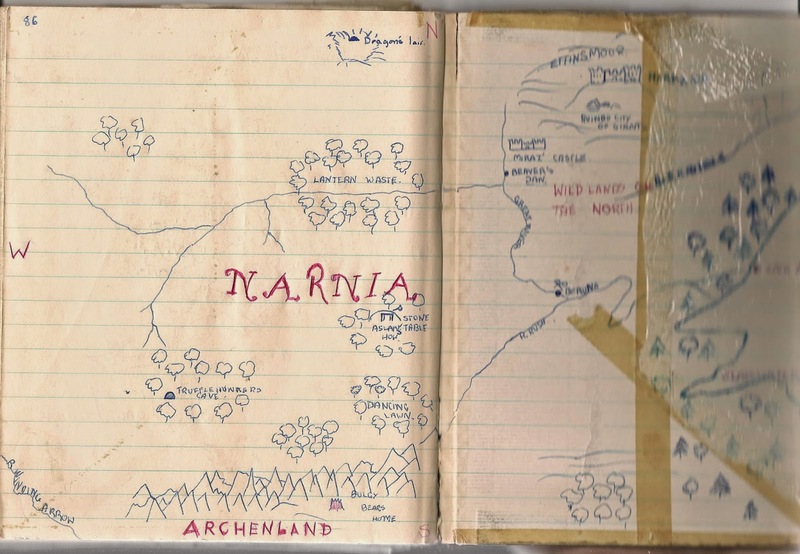 I was given my first Narnia book, The Silver Chair, when I was seven years old – a little girl living in Yorkshire in the 1960s. I went on to read the series out of sequence, ending with The Voyage of the Dawn Treader: it depended on what I could buy with my pocket money or find in the public library. The Lion, The Witch and the Wardrobe was published in 1950, The Last Battle in 1956, the year of my birth: so I suppose I was among the first generation of child readers of these tales. It’s impossible to exaggerate the effect the Narnia stories had on me. I adored them, I was super-possessive about them. 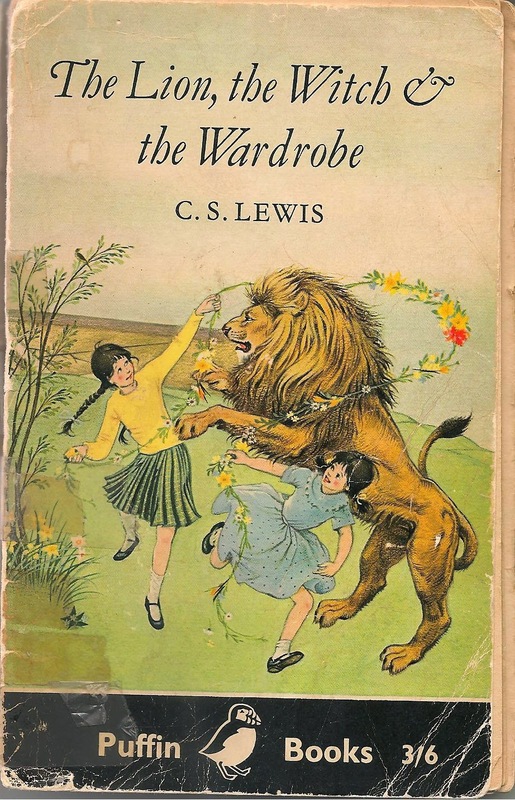 I regarded Narnia as my own, private, secret kingdom – so much so that when my mother, who read aloud each night to me and my brother, suggested she might read us The Lion, The Witch & the Wardrobe, I vetoed the suggestion. Narnia was mine; I wanted to keep it all to myself. It was horribly selfish, but that was how passionate I felt. I read and reread them for years. It’s decades now, though, since I sat down and read all of them through. Did the charm fade? I don’t know. The books were so much a part of my childhood that they still feel to be a part of me. So I’ve decided to begin again, to remind myself of what enchanted me and discover if it still has the power to do so. Over the next few months, I’ll be reading the Seven Chronicles of Narnia and letting you know my thoughts. Don’t expect academic crispness. These are likely to be long rambling posts with lots of digressions and asides as I follow wherever the fancy takes me. I hope you’ll tell me your own thoughts along the way. So here goes: let’s talk about Narnia. 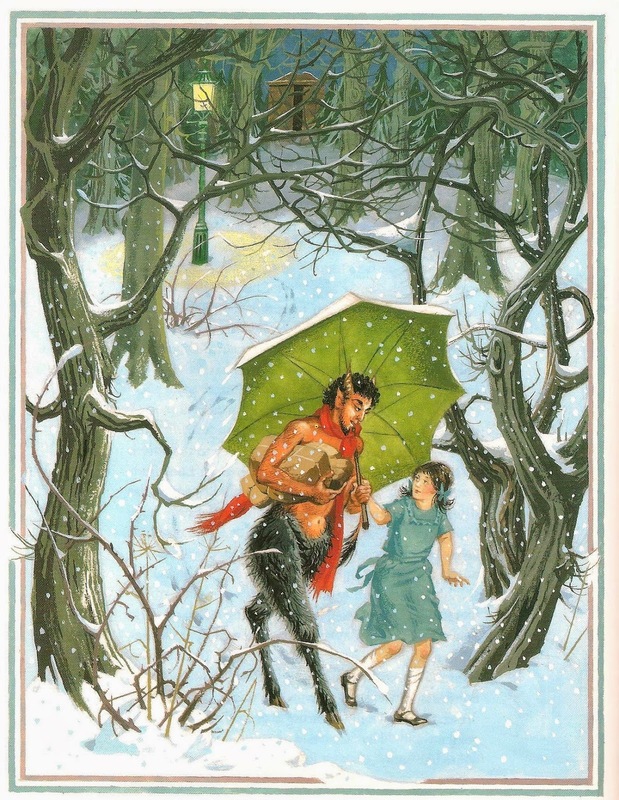 The first thing that strikes me now about The Lion, The Witch and The Wardrobe is how short it is: 170 pages, many with full, half, or quarter page illustrations by Pauline Baynes. I’d guess the length is not more than 35,000 words – about right for a book for seven year-olds; but books for seven year-olds written today do not commonly explore such rich emotional depths when dealing – if they deal at all – with subjects such as death, rebirth, police states, loyalty and treachery. 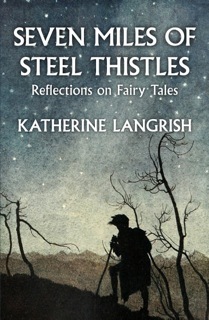 TLTW&TW is described by CS Lewis, in his dedication to his god-daughter Lucy Barfield, as a fairytale. Like a fairytale it deals in images, in strong, simple emotions, in primary colours, in poetic metaphor: and like a fairytale, it demands suspension of disbelief and a willingness to go along with the narrator. There were once four children whose names were Peter, Susan, Edmund and Lucy. and down a stair to a fabulous land where the trees have leaves of silver, gold and diamond, and where twelve princes row the princesses across a lake to a beautiful palace, to dance all night till dawn. This land is neither good nor bad (though one senses it is disapproved) but magical: other. 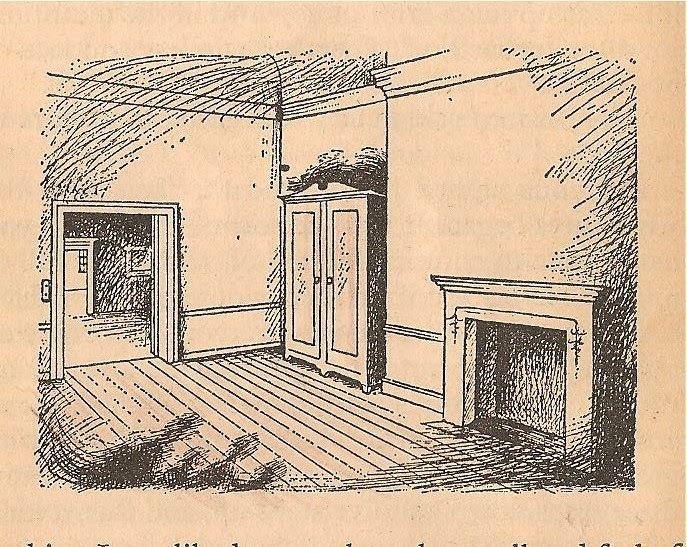 Alternatively, as in Bluebeard or in the English folktale Mr Fox, the secret of the hidden room may be horror and death. Narnia will turn out to contain both beauty and terror. So when Lewis chose a homely wardrobe for his doorway to Narnia (all of us had wardrobes in our bedrooms back then, before the days of fitted cupboards) he was employing a device common in fairytales, where the domestic and ordinary frequently reveal the magical and unexpected. Something cold and soft was falling on her. A moment later she found she was standing in the middle of a wood at night-time with snow under her feet and snowflakes falling through the air. A word about Lucy. Philip Pullman has accused the Narnia books of being – among other bad things – sexist, of delivering the message ‘Boys are better than girls’. People who agree with this tend, I suspect, to be thinking of ‘the problem of Susan.’ But I was a little girl reading the Narnia books, and I was never in any doubt that the main character, the clear heroine of the three titles in which she takes a prominent part, is Lucy. Any child, boys included, reading TLTW&TW will identify with Lucy for the simple reason that it’s so unfair when her siblings don’t believe her about Narnia – and even more unfair when Edmund actually lies about it. It’s as easy to identify with Lucy as it is to identify with Jane Eyre, and for the same reason: children hate injustice. Like Snow White, Lucy is quickly befriended by a denizen of the forest. And as in the seven dwarfs’ cottage, the cosy safety of Mr Tumnus’ house is soon compromised by the power of a dangerous queen. More terrifying still, Tumnus confesses himself to be a deceiver, an informer. 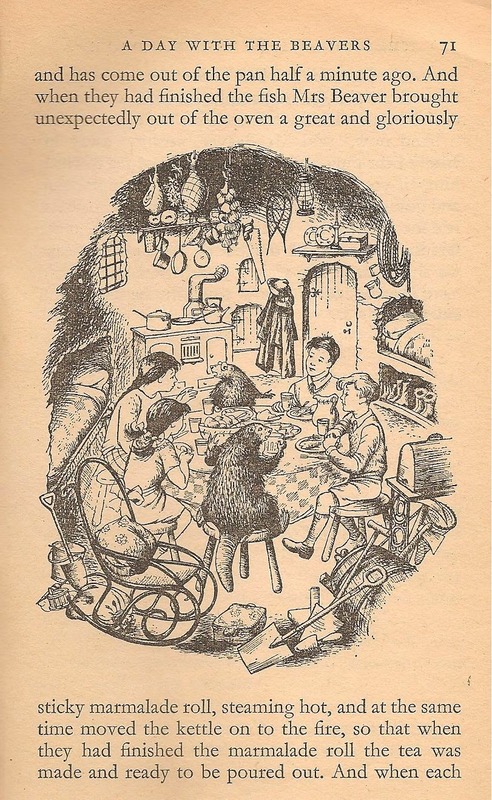 ‘I’ve pretended to be your friend and asked you to tea, and all the time I’ve been meaning to wait till you were asleep and then go and tell Her.’ Because, and remember these books were written during the Cold War, Narnia is quite literally a police state. This is strong stuff for young children – strong stuff for anyone. I think the reason why, in my experience at least, children aren’t very upset by it, is that they feel safe in the hands of the narrator. Lewis never forgets who he is writing for. The potential terror of Lucy’s predicament is modified by Tumnus’ repentance. The danger to her, once recognised, is already over. And for Tumnus himself, well – the danger is real enough, but this is clearly the kind of story in which good characters will, ultimately, be all right. I hope no one who reads this book has been quite as miserable as Susan and Lucy were that night; but if you have been – if you’ve been up all night and cried till you have no more tears left in you – you will know that there comes in the end a sort of quietness. You feel as if nothing were ever going to happen again. Is this condescension? I don’t think so. As a child, I never felt Lewis talked down to me, I felt he spoke as an equal, that he treated me seriously. He acknowledges the depth of children’s emotional experience, misery as well as happiness. By addressing the child reader directly, he turns Susan and Lucy’s grief into something we can share and understand, and the moment of Aslan’s death is thus softened and becomes more bearable. The other method by which Lewis gently defuses fear or terror is a deft use of comedy – for example when the children and the Beavers bustle to get away from the White Witch. Hurry, hurry! – the child reader thinks, yet at the same time is both amused (Mrs Beaver is being funny) and reassured (Mrs Beaver is a mother figure, and if she’s not scared, neither need we be). The door had been wrenched off its hinges and broken to bits. …Snow had drifted in from the doorway and was mixed with something black, which turned out to be the charred sticks and ashes from the fire. Someone had apparently flung it about the room and then stamped it out. The crockery lay smashed on the floor and the picture of the Faun’s father had been slashed to shreds with a knife. ‘Who gave them to you?’ said the Witch. ‘F-F-F-Father Christmas,’ stammered the Fox. At that moment, one of the young squirrels lost its head completely. ‘He has – he has – he has!’ it squeaked, beating its little spoon on the table. All this, before we’ve even got to the death of Aslan. As is well known, JRR Tolkien didn’t get on with Narnia, and one of the things that annoyed him about the series was Lewis’s carefree – or slapdash, depending on your viewpoint – world-building, bundling together everything and anything he’d ever loved in myth, legend and fairytales. Thus Narnia has not only talking animals out of Beatrix Potter or The Wind in the Willows, it also has nymphs, naiads, dryads and river gods from classical mythology, and giants and dwarfs out of the Northern legends. 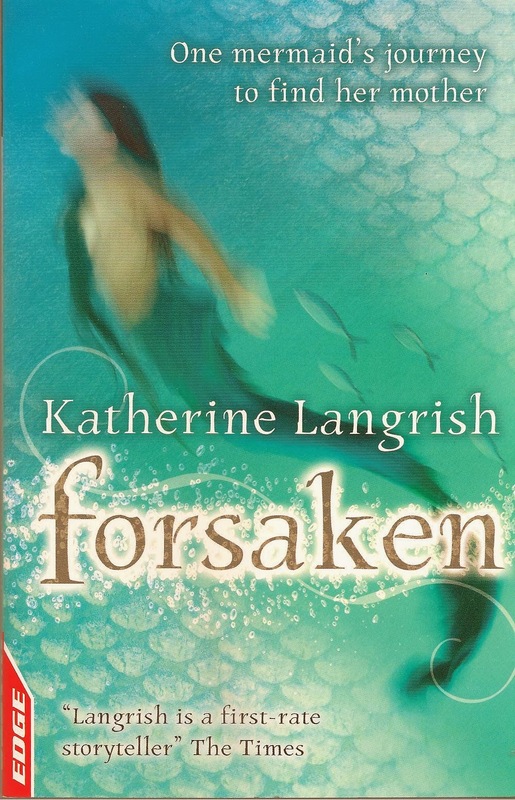 It borrows Green Ladies from medieval romances, and mystical islands from Celtic voyage tales and, in this one first book, it has Father Christmas. But when a writer has come up with a lovely phrase like ‘Always winter and never Christmas’, well what is he to do? I don’t mind this single meeting with Father Christmas in Narnia, although I do think Lewis was wise not to invite him back. He seems to me to echo the appearance of Grandfather Frost in Russian fairytales – the white-bearded old spirit of the snowy woods who just may, if you address him politely, give you gifts (rather than freezing you to death). Personally I find Father Christmas in Narnia easier to accept than Tolkien’s facetious reference to golf in The Hobbit, when Bilbo’s ancestor Bullroarer Took knocks off the head of the goblin king Golfimbul. ‘It sailed a hundred yards through the air and went down a rabbit hole, and in this way the battle was won and the game of golf invented at the same moment.’ Such self-conscious flippancy was one of the things that put me off The Hobbit as a child. And now for the vexed question of religion. Does this make children potentially more vulnerable to prejudice and propaganda? Perhaps. But it’s interesting to look at a much more obvious attempt at Christian fantasy by the Catholic children’s author Meriol Trevor, written a decade after the Narnia books, in 1966. 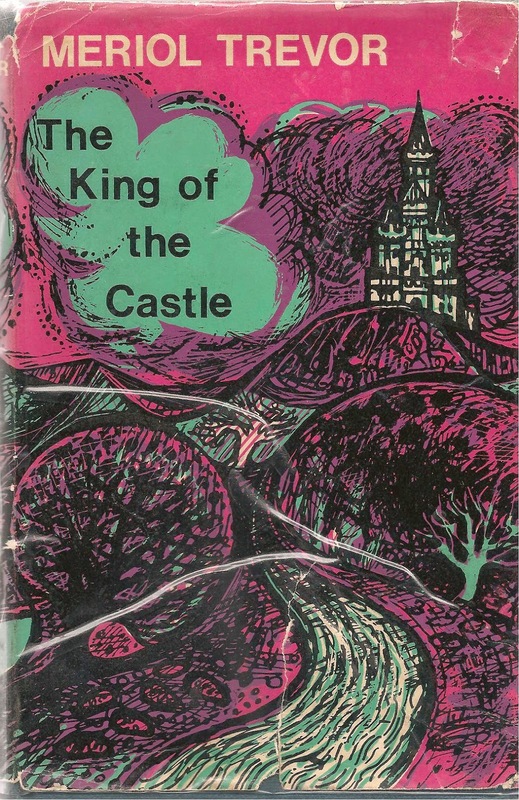 In The King of the Castle (Macmillan), a sick boy, Thomas, finds his way into the world of a picture hanging on his bedroom wall and meets Lucius, a shepherd with a phoenix ring, who believes himself to be the son of the High King. Reviled, disbelieved, eventually hanged, Lucius is restored to life by a Messenger of the High King, and claims his kingdom. The Christian message was obvious to me when I read the story as a child, but it didn’t capture my imagination, and a recent re-reading showed why: Lucius is wooden, the resurrection scene almost perfunctory, and there seems no narrative reason why the viewpoint character Thomas should be in this world at all. The book has nothing of the verve, the colour, the energy of the Narnia stories. Philip Pullman speaks for many who consider the Narnia books outrageous propaganda for the pernicious doctrine of an all-powerful God who demands innocent blood to atone for the sins of a supposedly corrupt humanity. From this viewpoint TLTW&TW is dodgy stuff. For a Christian reader, however, such a view is a travesty of the New Testamant stories and the doctrine that declares Christ to be a facet of a living and loving God who shares in the suffering of the world. No one, least of all myself, is going to be able to reconcile such opposite perceptions. But remember CS Lewis called his book a fairytale, and in fairytales the world over, good and innocent characters who die, come back to life. Think of Snow White in her glass coffin! In The Juniper Tree, the murdered boy is transformed into a beautiful, mysterious bird which deals out justice, rewarding the good and destroying the wicked, before turning back into a living child again. In Fitcher’s Bird, the third bride is able to restore her murdered sisters to life and escape the house of the sorcerer. Resurrections occur in fairytales because here, if nowhere else, there is a real chance that justice and goodness may prevail over evil and tragedy. Lewis came to Christianity through stories: he took them seriously: he regarded the incarnation, death and resurrection of Christ as a fairytale which really happened. We don’t have to follow him all the way. But we can still be moved by the tales. It is perfectly natural for a child to read The Lion, The Witch and The Wardrobe and to see Aslan as no more and no less than the literal account makes him: a wonderful, golden-maned, heroic Animal. I know, because that’s the way I read it, and that is why I loved him. Though the death of Aslan at the hands of the White Witch is the heart of the book, that ‘deep magic from the dawn of time’ works just as well on a non-Christian level. A beautiful, icy queen: a golden lion. ‘When he shakes his mane, we shall have spring again…’ Of course Aslan comes back to life! Who can kill summer?